This agreement is for a property buyer to put to a seller in response to seller's request for an overage payment. As written, it is fair to both sides, although it includes opportunities to harden or soften the deal as necessary in order to reach agreement. Most overage agreements are favoured by property sellers in order to obtain the maximum present and future value from the sale of their land. This agreement has been written for a buyer, because it is more likely than not that in a speculative offer, it is he or she who initiates the deal. It is therefore strongly in the interest of the buyer to produce the contract in a version he or she can live with. The parties can then negotiate the finer points based on that document. It is suitable for any land deal, regardless of value. 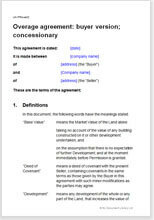 The terms could be incorporated in the contract for sale or the document could be used as a stand-alone agreement. The terms provide for payments on repeated sales over as long a time period as you wish. However, the buyer should avoid being drawn in to a long overage period, because a future owner of a developed part, such as a house or workshop owner, may have difficulty in finding a mortgage lender on an overaged property. The aim of this document is to provide a framework which entices future owners to develop and not one which ensures that they do not develop. Use this contract when you buy any land. The land does not have to be open land. The document is just as binding when the land is an old industrial shed or a perfectly good office building that stands in the way of larger development. The benefit of using an overage agreement is that the buyer is not at risk of buying at a price which does not reflect the current value, while the seller can look for a future share of future value without the expense and work involved in achieving it. This contract is in plain English. Nonetheless it is a sophisticated document drawn by a property specialist solicitor. It is suitable whether you are an individual or work through a company incorporated in England or Wales. If you are the existing property owner, we also sell a version of the agreement that favours the seller.